I’m proud to announce that from now on the worldwide magazine Row360 wil place a spread of one of my favourite pictures every issue. 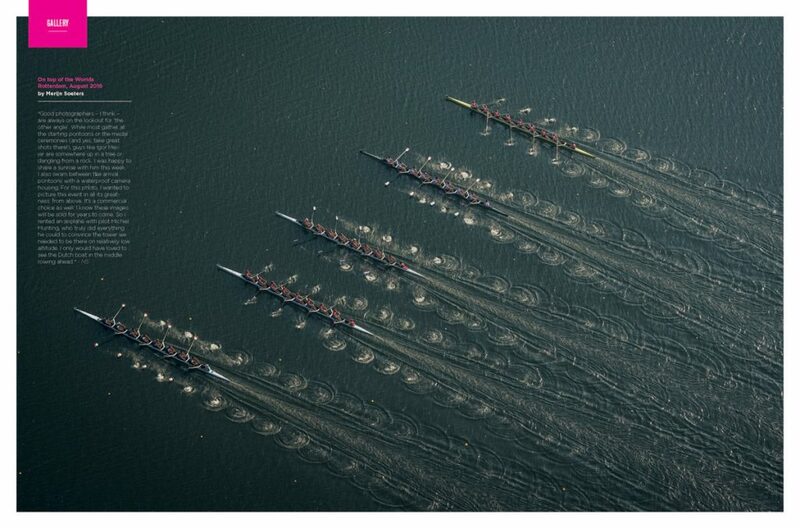 This month: the 2016 World Rowing Championships from above. Order your subscription here. The 2016 World Rowing Championships in Rotterdam were an unprecedented event. Or a combination of three really: Juniors, U23 and seniors. 1905 rowers. Medals to be awarded in 42 disciplines. That’s a lot of gold, silver and bronze. The course in Zevenhuizen, the village the Willem-Alexander Baan is actually situated in, proved to be perfect for an event of this magnitude. A lot has been said about the venue near the coast. During national regattas the windyness makes it a real challenge to align the boats, but with the automatic starting system, not a lot is left to complain about. Yes, rowers do need to battle the winds that are strong in the open field, but they all have to do so equally. As the course is designed as a basin for superfluous water in the region, during large rowing events the waterlevel can be raised to the optimal level (and depth) FISA requires. Not a lot of presents are handed out during row call (pun intended). Good photographers –I think- are always on the lookout for ‘the other angle’. While most gather at the starting pontoons or the medal ceremonies (and yes, take great shots there! ), guys like Igor Meijer are somewhere up in a tree or dangling from a rock. I was happy to share a sunrise with him this week. Also I swam between the arrival pontoons with a waterproof camera housing. As I shoot for many Dutch clients, I wanted to picture this event in all its greatness: from above. It’s a commercial choice as well: I know these images will be sold for years to come. So I rented an airplane with pilot Michiel Munting, who truly did everything he could to convince the tower we needed to be there on relatively low altitude. I only would have loved to see the Dutch boat in the middle rowing ahead. This is the spread in this month’s Row360 magazine.